The JD (S) can only hope to increase its share through its alliances with ‘others’, while the BJP would be content with chipping into the vote share of the two main players in the Old Mysuru region. Touring Mysore state in the late 1920s, Gandhiji had lauded Maharaja Nalwadi Krishnaraja Wodeyar as a ‘Raja Rishi’ who had ushered in ‘Ram rajya’. He wondered if Mysore even needed freedom. His optimism was not misplaced. Under Nalwadi and his dewans like Sir M. Vishweshwaraiah and Sir Mirza Ismail, Mysore achieved a high degree of socio-economic and industrial progress. Bangalore was India’s first electrified city in 1905 and the Krishnaraja Sagar Dam, on its completion in 1931, was the largest in Asia. Today’s southern Karnataka is the heart of princely Mysore and is one of the most developed regions of the state, offering 61 seats to the assembly. Here, the BJP is a minor player and it is a direct and bitter Congress-JD (S) clash. The Lingayats and the Vokkaligas have been dominant castes in Karnataka since time immemorial and the power tussle between them is no secret. Of the 89 constituencies in Old Mysuru and Bengaluru Urban, the Vokkaligas are game-changers in about 70-75. Karnataka, to date, has elected five Vokkaligas, six Lingayats, three members of the backward classes, and two Brahmins as chief ministers. The Vokkaligas (primarily agriculturists) had earlier consolidated against the BJP, which was seen as a Lingayat party. In this election, the Vokkaliga ire is directed against Siddaramaiah, who they believe is inimical to their interests and a betrayer of their beloved leader H.D. Deve Gowda. Siddaramiah’s intense personal rivalry with the Gowdas, since they parted ways in 2006, has distanced him from the Vokkaligas further. As a champion of the AHINDA (Minorities, Dalits and backward castes) movement, Siddaramaiah is seen as being discriminatory to the Vokkaligas and partial to his Kuruba community in administrative postings, promotions, and even welfare schemes. This Vokkaliga consolidation, with its epicentre in Siddaramaiah’s own constituency, Chamundeshwari, is the Congress’ worst nightmare. With the BJP’s steady progress in northern and coastal Karnataka, a decimation of the JD (S) in Old Mysuru is Congress’ only hope for a return to power. Out of 40 JD (S) seats in 2013, 14 came from the Vokkaliga-dominated districts of Ramanagara, Mandya, Hassan and Mysuru. A lot is at stake for the JD (S) in these elections, as it fights against a long exile from power, funds-crunch, poaching of its leaders by the Congress, and for its very existence. In 2013, the JD (S) lost 38 constituencies by a margin of 300-3,000 votes. This time, with an alliance with the BSP (which has a base of about 1,000-2,000 votes in several constituencies) and the AIMIM, the JD (S) hopes to erode the Congress’ AHINDA votebank among Dalits and Muslims. 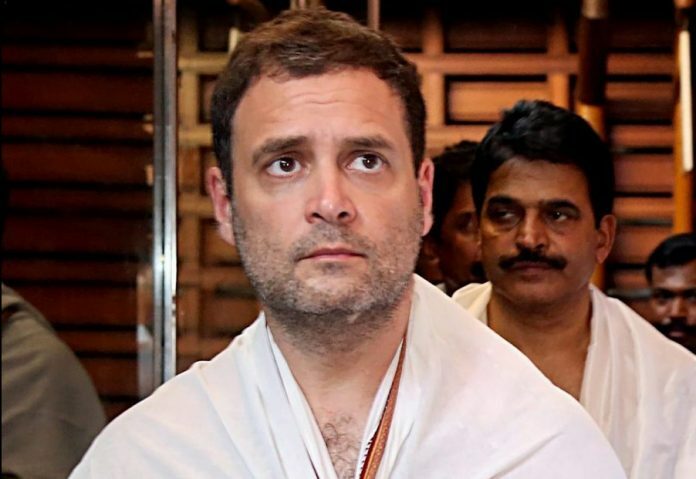 Precisely to retain Muslim voters, the Congress has been raising the spectre of the JD (S) being the BJP’s B-team, and reminding them of the alliance between the two parties in 2006. Deve Gowda and H.D. Kumaraswamy have been at pains to emphasise that they would prefer fresh polls to allying with the BJP again — the former even saying he would disown his son if he recommits his 2006 blunder. Fishing in these troubled waters, with his lavish praise for Deve Gowda (even as he exhorted voters not to waste their votes on JD (S)), PM Narendra Modi hopes to win Vokkaliga sympathies by pitting them against the Congress and also keeping a door open for future alliances if voters throw up a hung assembly. Even the slur by Dinesh Gundu Rao on Yogi Adityanath was portrayed by the BJP as an insult to Vokkaliga pride since Yogi’s ‘Natha Pantha’ tradition has links with the most influential Vokkaliga math — Adichunchanagiri. The Cauvery being a lifeline of Old Mysuru, the water-sharing dispute with Tamil Nadu has repeatedly shattered peace and public life in this region. Horrific riots have occurred in 1991, 2002, 2012 and 2016. The Supreme Court coming down heavily on the Karnataka government on 3 May 2018 and the Centre dillydallying in constituting the Cauvery management board have only added to the Congress’ woes. The once fertile Mysore region presents a dire image today. Eighty per cent of Karnataka is drought prone. It is the second most arid state after Rajasthan. The year 2016 saw the third consecutive drought and the severest one in 40 years with 42 per cent of minor irrigation tanks running dry. There has been a rainfall deficit of 90 per cent in Karnataka, where rivers are fed by the south-west monsoon. The orders to release water to Tamil Nadu have sounded a death knell not only for irrigation, but also the drinking needs of Bengaluru, Mandya and Mysuru. The tobacco cultivators of Hunsur and Periapatna have been in a vicious debt cycle, unable to repay their loans due to low productivity and income. The farm distress has made Karnataka the state with the second highest number of farmer suicides, after Maharashtra. The state agriculture department mentions that as many as 3,515 farmers — largely sugarcane growers, followed by cotton and paddy cultivators — have killed themselves between April 2013 and November 2017. Most of these belong to Old Mysuru region. Parliament was informed that in 2016 alone, Karnataka saw a 32 per cent rise in farmer suicides, while the national trend ran contrary, with a 10% decline. The state government has been paying Rs. 5 lakh as compensation and alleging zero help from the Centre, but this is just not enough, given the deep malaise. 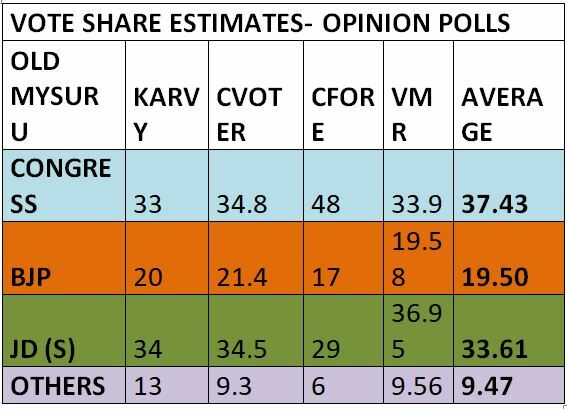 The CFore, Karvy, CVoter and VMR opinion Polls indicate that, as of April end, the Congress was ahead of the JD (S) by 3.81 per cent of the vote share in Old Mysuru. The JD (S) would only hope to increase its share through its alliances with ‘Others’, while the BJP would be content with chipping into the vote share of the two main players here. Dr Vikram Sampath is a Bengaluru-based award-winning author/historian and political commentator. This is the third essay in a series by the author on the upcoming Karnataka elections. Read the first part and the second part.